When last we left the Hulk, he was depowered following his fight with Zeus, and had been captured by Miek, who used his still-healing body to incubate alien insect larvae. This issue picks up from that point, with Miek having brainwashed the weakened Green Goliath and set him against his Warbound allies and Ka-Zar. 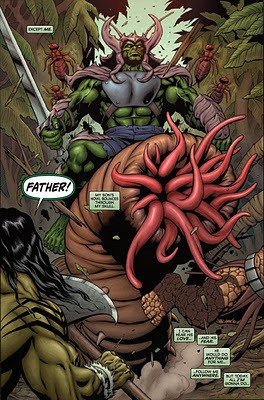 What follows includes the broad strokes you'd expect, of course--Hulk breaks Miek's control, gets angry, heals, and beats the big bug--but there are decent surprises in the mix, too. Those surprises are especially illuminating considering some of my comments on the relationship between the Hulk and Miek during my last review. The issue is nearly impossible to discuss without addressing the key development in Miek's life since the Warbound miniseries, but that doesn't mean I'm not going to try. The advancement of the Miek storyline improves my overall opinion of the "Planet Savage" storyline considerably after last month's perceived decline. The change in Miek that's outright stated this issue makes sense in context (although, whew, is it weird!) and makes sense of the character's behavior with the Hulk and the Imperials earlier in the storyline. True, it's a major shift and may not be appreciated by all fans of the character, but, well, Miek is a character who's never truly remained static in body (while adhering to the Hulk's perceived mindset of "never stop making them pay"). The battle between the Hulk and Miek is appropriately grandiose, hitting all the right emotional chords. Is the character gone for good? Probably not, and it's a good question whether even the changes in this storyline will stick when the next writer arrives. I do however feel that Miek's arc completes itself well here. What about the Hulk? His battle with Miek highlights his own tensions with the Warbound and his own son, and those tensions mount to a climax this month that paves the way for Rob Williams and Brian Ching's Skaar: King of the Savage Land miniseries due April 6 (which, I'm guessing, is where the Warbound will make their next appearance). The interaction between Hulk and his son is well indicative of the former's own emotional stuntedness and suits the character perfectly. Probably most surprising and most subtle is the work by Pak this month that resolves the Hulk's own healing problems. They're never directly referenced in dialogue or captions, but Eaglesham's art brings the point home loud and clear that this Hulk is angry, and hence, as formidable as he's been in some time. In fact, this act is the strongest in the storyline all around, with everyone perfectly on-point. I did lament the loss of Dean White on colors, but Hollowell and Martin were able substitutes. So, what's next for the Hulk--or is that still Hulks? (Solicitation copy and writer Pak's own comments have placed this issue as the end of the Incredible Hulks status quo, but a preview ad in the issue seems to state the book will continue in the plural for at least another arc.) While Skaar cuts loose in a new miniseries, the Hulk will return to deal with Red She-Hulk, it appears. 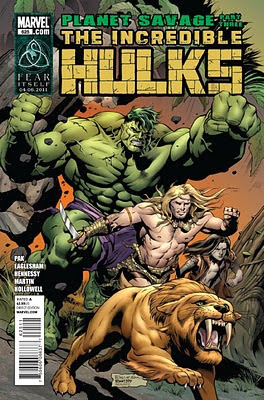 This issue seems to close the loop on the Hulk's Warbound companions, which seems apt as "Planet Hulk" scribe Pak is also preparing to exit the book. Things are winding down and yet the momentum is just picking up again. If you didn't enjoy the last issues of this arc, come back, because here's where Pak, Eaglesham & co. give up the goods. Big, disgusting bugs? Check. Rich, emotional storytelling? Check. Hulk doing what he does best? Big ol' check. I honestly liked this issue, for I feel it was the best part of Planet Savage. It really sets up for the King of the Savage Land series with Skaar. I can't wait to pick up the first issue, because other than Hulk, I've been wanting to read more about Skaar. I also like this issue because I feel like Hulk's finally taking back control. From Incredible Hulks #612-623, it always felt like Banner was controling and suppressing Hulk's anger and rage, restraining his might. It feels good to see Hulk back in control and smashing! I'll have to check out the next Hulk story arc, to see if it'll be any good or not. I just hope that Pak gives us nothing but good action and story telling from here on out. Good review. You seem to think Zeus knew about what was going to happen in the last 3 issues and part of the reason he tortured the Hulk was so that Miek could do what he wanted to. Do you think Zeus also knew that the plan would fail and end up this way? Or is this just a step toward something more? Zeus mentioned the punishment for his deeds was coming back to get the Hulk. This was near the end of 622. So it hints that he may at least know something or is indirectly involved in it. Zeus may have talking about these last few issues or he may be hinting at things yet to come.